At Schumacher Auto Group, we have one mission: to serve customers for life. For over 40 years, we’ve upheld this promise. And we’re committed to giving back to our community and thanking you for all you do. Our exclusive Partnership Plan guarantees you are provided the best Sales & Service experience! Whether you are shopping for a new car or are in need of service, you can visit any of our dealerships below and enjoy the following benefits. We’re a family-owned business, and this family-first focus shows in everything we do. We believe everyone deserves to drive a quality car, and that’s why we offer low APRs and a variety of lease deals. Our dedication to our customers doesn’t end when you sign the papers. Our team of highly trained technicians is ready to help if you hit any bumps on the road. Along with our first-rate maintenance and repair service, you’ll enjoy exclusive service specials, as well as our Schumacher Family Rewards Program. 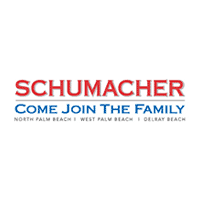 At Schumacher, we don’t make deals — we make connections. When you walk into one of our dealerships, you’ll be welcomed with a smile and a staff of car experts prepared to guide you through a stress-free car buying experience. Explore our family of dealerships and experience the difference of Schumacher service for yourself.